New Law Journal, Summer 2016; Light Blue Law (The Cambridgeshire and District Law Society Newsletter), July 2016; D&DLS Bulletin (Derby & District Law Society), Summer 2016; Hertfordshire Law Society Gazette, July 2016; Suffolk and North Essex Law Society Magazine, June 2016; Norfolk Law, Summer 2016 and Northamptonshire Law Society Bulletin, Summer 2016. New Law Journal, 22nd February 2013; Light Blue Law (The Cambridgeshire and District Law Society Newsletter), Winter 2013; D&DLS Bulletin (Derby & District Law Society), December 2013; Hertfordshire Law Society Gazette, January 2014. Light Blue Law (The Cambridgeshire and District Law Society Newsletter), Winter 2014; Hertfordshire Law Society Gazette, Winter 2014/2015; D&DLS Bulletin (Derby & District Law Society), Jan/Feb 2015; Cambridgeshire & Hertfordshire Law Magazine, Jan/Feb 2015. Derby & District Law Society Magazine, March 2015. Should rapists gain parental responsibility? Derby & District Law Society Magazine, Spring 2016; Suffolk and North Essex Law Society Magazine, Spring 2016; Norfolk Law, Spring 2016; Northamptonshire Law Society Bulletin, Spring 2016. In over 15 years of delivering paternity tests I thought I had seen it all, but the scriptwriters for the new Belfast based BBC drama have truly excelled themselves with “Paula”. The story is of a chemistry teacher who gets herself into a pickle with a married PR teacher at the same school. She tries to end the relationship but into her life comes desperate handyman James with a one night stand and extortion on his mind. He kills in a botched handover and frantically tries to cover his tracks to protect the two women he lives with, each of whom have children but whom he calls his “cousins”. McArthur, or Mac, the incredibly sweet but emotionally vulnerable investigating detective also becomes embroiled with Paula while James is on the run. Paula incarcerates James in a cupboard in her basement and without a hint of emotion, accepts Mac’s invitation for something to eat. In the final and unexpected “I’m pregnant” scene we are left wondering about the paternity of the biological father…was it the dead PR teacher, the incarcerated James or Mac the detective? A DNA test reveals a surrogate mother is in fact the biological mother of one of the twins she was carrying. Issues such as infertility, miscarriages, age of parents and certain medical conditions may have an impact on a couples ability to carry their own child. The practice of surrogacy gives hope to these couples at starting a family of their own. Surrogacy is when a woman carries the biological child of another couple. Although the surrogate mother is to give birth to the child, all parental rights and responsibility is intended to be later transferred to the biological parents after the birth of the child. However, there are many issues that couples considering surrogacy must be made aware of. Recently in the news, a woman has spoken about her experience as a surrogate mother. 6-7 weeks into the pregnancy, an additional embryo was found in the womb. Doctors assumed the embryo implanted has split into two, resulting in twins. After the birth, the children were given straight to the assumed biological parents who later signed the birth certificate. The surrogate mother was later informed that the biological mother had doubts over the parentage of one of the children. A DNA test later confirmed that one of the babies was the child of the surrogate mother and her husband. Doctors later explained that superfetation had occurred: the development of more than one offspring in the womb despite being conceived on different dates. Although this is very rare in humans, it is in fact possible for a woman to ovulate while already pregnant and this information should be made clear to couples and individuals considering surrogacy. Not only did the surrogate have to prepare for a new born baby overnight, they were also asked to pay back fees to the couple as they had paid her to carry more than one child. The surrogate mother was also told she had no parental rights for the child as she was not named on the birth certificate and that if the surrogate couple wished to put the baby up for adoption, they could. They couple were eventually reunited with their baby 10 months later. UK surrogacy laws deemed inadequate and out-dated. There has been a demand for urgent changes to surrogacy laws in the UK as many surrogate mothers deem them as out-dated and an inadequate representation of the modern family. Surrogacy is an arrangement whereby a woman carries a child for another individual or couple who usually are having trouble conceiving. 1. Traditional surrogacy – the surrogate’s egg is fertilised via artificial insemination. The surrogate mother is therefore the biological mother of the child. What are the laws surrounding surrogacy? • The surrogate mother is the legal mother of the child. • The child’s legal father is the surrogates partner or husband, if they gave permission for the surrogacy to go ahead. • If the surrogate is unmarried and has no partner, the child has no legal father. • Parental rights can be transferred to the biological parents through adoption or parental order. • It is illegal to pay for a surrogate in the UK with the exception of reasonable expenses. • Surrogacy contracts aren’t enforced by UK law. Many have argued that these laws are demoralising, as the child’s biological parents are not recognised from birth. Although the Parental Rights for the child can be transferred to the biological parents, this process can take up to two years to complete. In the mean time, the biological parents have no rights for the child; this even includes the ability to make medical decisions on their behalf. The laws introduced in 1985 are a reflection of family life dating back to the 1980s. However, society has changed. Improvements to technology and changes in society have meant that people are now creating a family in many different ways: surrogacy, IVF, gamete (egg and sperm) donation, gay couples and single parenting. With approximately 1 in 7 couples in the UK have problems trying to conceive a child ; these methods are being used more and more commonly used. The uncertainties surrounding surrogacy in the UK may cause many couples to look for a surrogate overseas. However, international surrogacy is a very complex area. Once the child is born, the process of bringing your child to the UK is very long and complicated. In order to protect the surrogate, the child and the biological parents, the laws need updating to reflect the modern day family. 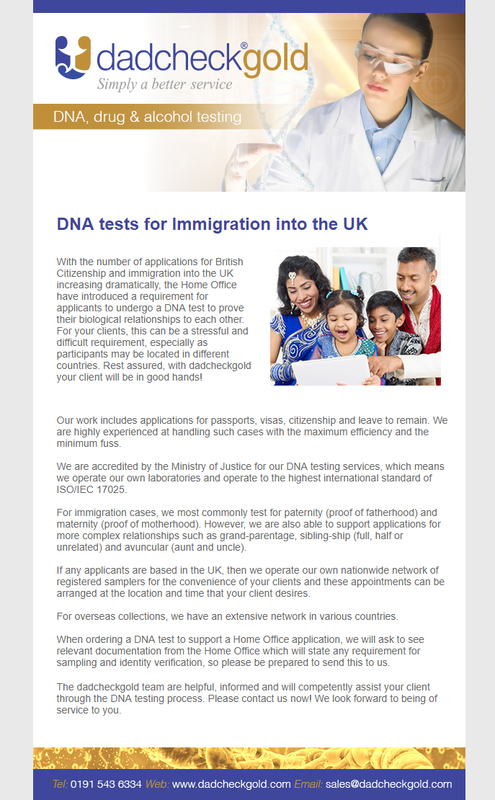 Online only DNA testing for the general public. Trading since 2000, Complement Genomics is an innovator in genetic testing technologies. We were the first to truly take DNA testing to the general public via dadcheck.com and continue to bring forward new and improved DNA testing services. We work through our branded services, each of which serves a different market segment.